Wallowa Buddhist Temple is located on a 5-acre rural property in the foothills of the Wallowa Mountains. The temple building includes a spacious room that serves as the temple's meditation hall. The grounds are peaceful and beautiful, with Eaglecap Wilderness mountain views, and shrine areas and pathways throughout groves of lovely aspen and pine trees and along Hurricane Creek. It is a truly remarkable place, spiritually speaking, and perfect for a small contemplative Buddhist temple serving a local congregation and offering individual spiritual retreats. More pictures of the Temple grounds may be seen here. 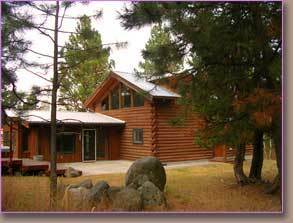 For more information about the Wallowa Buddhist Temple, please contact Rev. Meido.